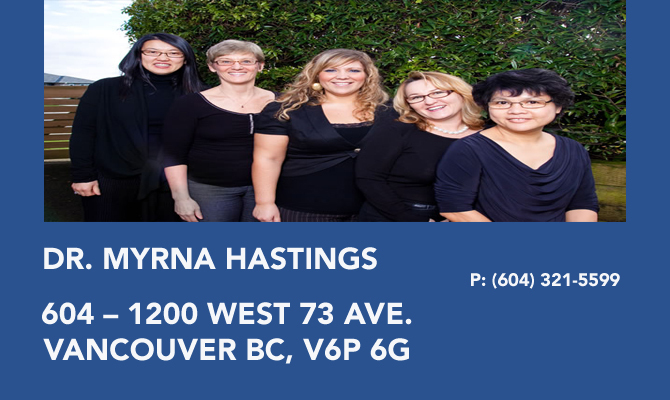 Dr. Myrna Hastings earned her dental degree from the University of British Columbia Dental School in 1985. Prior to dentistry she did a B.Sc. in Chemistry at U.B.C. Upon graduation from dental school, Dr. Hastings practiced for one year in her hometown, Kamloops, BC, before returning to Vancouver. Dr Hastings is a member of the College of Dental Surgeons of BC and the Canadian Dental Association. Over the course of her career she has taught at the UBC Dental School and has been involved in many study clubs including cosmetic and restorative dentistry, endodontics and most recently, implant dentistry.